This CD includes Garry Owen: our most popular download on Routenote Amazon iTunes and other download sites! Old Time favorites and singalongs that folks tell us they love to hear the most. This music made its way Out West and it still sings real good today! Even though this music traces its own heritage back to Ireland and Scotland via the American immigrants who came over the waves and then headed out across the mountains and the plains - like our families and maybe yours - most people tell us they don't really care if it's Celtic at all, because it's our own American folk music that we all grew up with and love! We also including a few new folk originals! "Your singing is beautiful and these are songs I have not heard for many years. I used to sing songs like these to my son when he was a baby and this CD brings back fond memories!" 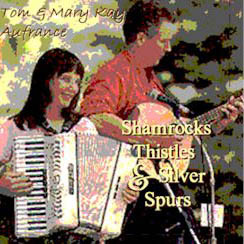 About Tom and Mary Kay Aufrance This popular Lake Tahoe area folk duo performs as Slim and Minnie at festivals, county fairs and other venues in California and Nevada. Find out more on their music web site.